Significant texture work has been done that represents a complete remake of the original texture. Every detail has been redone and the texture expanded to 2048x 2048. The MG texture has also been updated and is included. Less color saturated but more detailed T-80U original pattern; track by RogueSnake79. 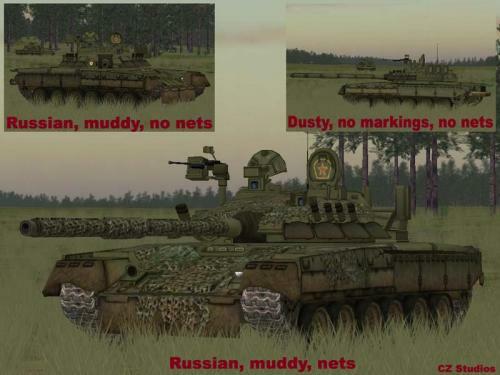 There are 4 T-80U desert skins; 1 base desert yellow, and 3 color variations based on the same two toned camo scheme. 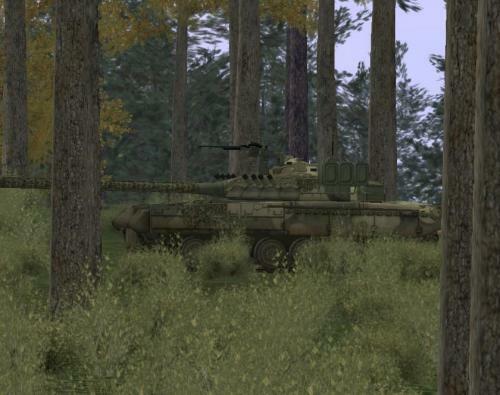 This file contains 8 skins + track for T-80U. They come with Russian Guards-unit markings or without, with camo nets or without and muddy or dusty (heavy/light weathering). Pick your favourite - Enjoy! Basically same as the woodland skin, just changed the yellow painting to look more white/grey, added a thin whitish layer + extra winter tracks. Made by Jaguar. It's the original skin, only resized and sharpened. Added are glasses for vision slits, lamps etc. Plus, all new running gear (road wheels + sprocket wheel), all photo-realistic. Track file also included. Made by Jaguar.